their booth in the Palmeria. 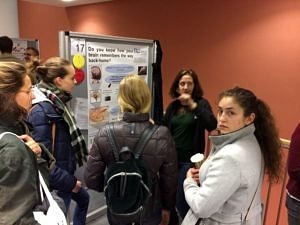 From 6 p.m. to 1 a.m. visitors had the opportunity to inform themselves about the brain and the work as PhD student in neuroscience. Posters provided amazing facts about the brain, a self-made model visualized the anatomical structures and their related functions and a light microscope offered a glance at histological structures of the brain. Especially the young visitors had a lot of fun to experience the texture of a brain and to learn how our senses can be tricked in a self-experiment. Finally, they could test their newly acquired knowledge with a quiz. All GRK students enjoyed their job and were very engaged to introduce the interested visitors to the basics of neuroscience and to arouse interest in this field of science in a very relaxed atmosphere. The overall feedback from the public was overwhelmingly positive and people were eager to gather information about the work of the GRK and its topics. 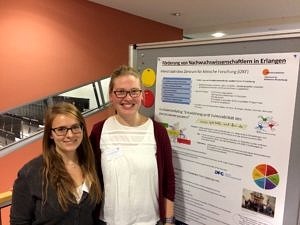 The information event „Forschungsbörse” was initiated to get students enthusiastic about research in the public health sector and give them the opportunity to get easily in contact with the people “behind” the research. Our phD students Lena Hofmann, Jana Heppt und Judith Stemick togehter with Prof. Lie introduced the GRK and its projects and activities. They gave insight into the research topics of the GRK and the life of a phD student within our GRK. The “Forschungsbörse” took place in November 2018. Prof. Lie and Prof. Winkler together with Dr. Regensburger (former holder of the GRK rotation position) and Christian Fiebig (holder of a GRK MD stipend) gave insight into the opportunities of successfully doing research parallel to medical studies or working in the clinic. Everybody who was interested in a medical thesis in the field of neuroscience or in a career as “clinician scientist” was welcome to join the event.